Hyoid and laryngeal excursion kinematics – magnitude, duration and velocity – changes following successful exercise-based dysphagia rehabilitation: MDTP. Sia I, Carvajal P, Lacy AA, Carnaby GD, Crary MA. Variability in magnitude of deglutitional hyolaryngeal excursion in patients with dysphagia suggests that it does not adequately represent the kinematics of swallowing difficulties or recovery following rehabilitation. On the other hand, reduced hyolaryngeal excursion velocity has been reported in patients with dysphagia. While increased movement velocity often accompanies clinical and functional recovery in many diseases, velocity changes in swallowing-related movement following dysphagia therapy have not been well studied. 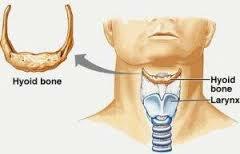 This study evaluated changes in hyoid and laryngeal excursion (magnitude, duration and velocity) before and following successful dysphagia therapy to provide a more comprehensive representation of improvement to swallowing kinematics in patients who have experienced successful rehabilitation. A secondary analysis of case series data was completed. Eight patients with severe, chronic dysphagia completed a standard course of an exercise-based dysphagia treatment programme (McNeill dysphagia therapy program, MDTP). Pre- and post-treatment, kinematic aspects of swallowing were evaluated for thin liquid, thick liquid and pudding swallows. Maximum hyoid and laryngeal excursion magnitude and excursion duration were measured. Excursion velocities were calculated from excursion magnitude and duration measures. Successful treatment for dysphagia facilitated increased hyolaryngeal excursion magnitude, duration and velocity. These changes were most prominent for the hyoid and most often observed with thin liquids. By examining hyoid and laryngeal excursion velocity in patients who have experienced successful dysphagia rehabilitation, this study demonstrated the value of evaluating spatial and temporal aspects of swallowing kinematics in a single measure for a more comprehensive representation of positive changes underlying functional recovery. Este post foi publicado em Treatment em 14/12/2014 por Tatiana Simões Chaves.